Residual harvesting in British Columbia: online presentation now available! 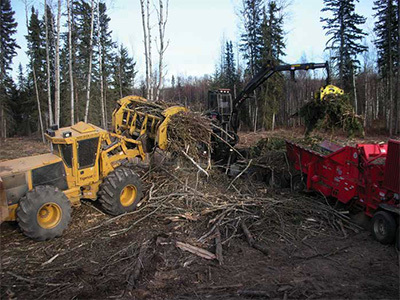 With utilizing forest harvest residues being an issue of growing urgency in the British Columbia forest industry, FPInnnovations’ Fibre Supply group introduced the guide, Best Management Practices for Integrated Harvest Operations in British Columbia, in 2017. This year, to address the growing need to access information online, FPInnnovations is proud to introduce an online narrated presentation that summarizes the guide, and highlights its main concepts. The presentation, available on FPInnovations’ Youtube channel (https://youtu.be/nMsDnCPPdzY), is meant for resource managers interested in further utilization of logging residuals. Topics covered include a description of residual piles and components, and outline best practices for both primary and secondary harvesters. The guide—Best Management Practices for Integrated Harvest Operations in British Columbia—is also available to view or download on FPInnovations’ Tools and Resources webpage (https://fpinnovations.ca/ResearchProgram/forest-operations/fibre-supply/pages/tools-and-resources.aspx). For more information about the guide or the online presentation, please contact Stuart Spencer (stuart.spencer@fpinnovations.ca). The construction of timber bridges offers many benefits such as competitive cost, speed of construction with prefabrication, lighter foundations, and quicker installation. The weight of wood is lighter when compared to concrete and steel, and this has a major influence on foundation design, seismic load during earthquake events, and transportation costs. The speed of assembly associated with prefabrication has positive financial, noise, health and safety, and environmental implications. The construction of the Petawawa Research Forest (PRF) Centennial Bridge offered a perfect example of that. The Petawawa Research Forest (PRF) was established in 1918 and is the oldest research forest in the country. Managed by the Canadian Wood Fibre Centre (CWFC) under the Canadian Forest Service, Natural Resources Canada, it influences forest policy, industry, silvicultural practices, and private forest management practices across Canada. In recent months, the failure of a culvert system impacted movement of logging trucks, vehicles, and research teams, in addition to negatively impacting water flow and habitat. FPInnovations collaborated with different partners and stakeholders to help design a modern single-lane engineered wood products bridge, named the Centennial Bridge. As a result of the advancement of new engineered wood products (EWPs) and increased interest in using environmentally responsible and renewable resources, the bridge was designed out of EWPs, in accordance to CSA S6-14 Canadian Highway Bridge Design Code (CHBDC) with CL-625ON Truck Load. An environmental assessment took place to ensure the protection of environmental and wildlife values. 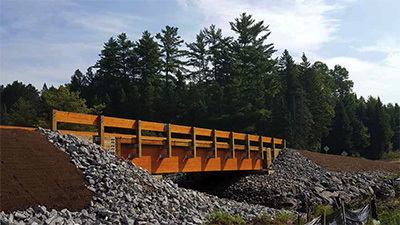 The Petawawa Research Forest (PRF) Centennial Bridge is an excellent example of how a modern forest access road bridge can be built with new engineered wood products (EWPs). It demonstrates that timber bridges could be compatible with Sustainable Forest License (SFL) needs when constructing water crossings. Costs would likely be similar, with EWPs being more economical in some situations. The difference in cost between steel and EWPs may be relatively small in relation to the total installed cost of the bridge. A time-lapse video showing the progress of the project is presented here: https://youtu.be/Eo9F63Uzf0U). More information can also be obtained by contacting John Pineau, FPInnovations’ Ontario Provincial Leader (john.pineau@fpinnovations.ca). The key to building any commercial venture is having a consistent, reliable, affordable, and accessible feedstock upon which to develop products that are in demand in the marketplace. The Canadian Wood Fibre Centre (CWFC) has developed, reviewed, assessed and validated two sources of woody biomass feedstock over the past 15 years that represent potential pathways for individuals, investors or established businesses to more directly participate in Canada’s growing bioeconomy. The first source of this valuable feedstock can be called opportunity wood biomass. “This is basically woody biomass derived from residues associated with some other action like logging, sawmilling, and forest products processing as well as the residues from final uses like renovation and construction waste, which can be defined as urban wood waste,” says Derek Sidders, Project Manager for Technology Development at CWFC. Logging alone generates several million oven dried tonnes (ODT) annually of field residues. Between 20 and 30 million ODTs of residue or secondary wood product materials are generated annually from the various industries associated with primary forest product manufacturing. Urban wood waste represents between 8 and 12 million ODTs annually of opportunity biomass, often simply disposed of in landfills. So that is the biomass opportunity. Here is one way to find it. To assist in locating potential Canadian sources of opportunity or purpose-grown wood fibre, CWFC has completed a national online inventory called the Biomass Inventory Mapping and Analysis Tool (BIMAT). It gives users the ability to conduct a query in various locations across Canada, starting with a point on a map and conducting a radius sweep from that point to estimate the potential supply of annual wood residue within that circle. The second source of woody biomass feedstock is purpose-grown wood biomass. CWFC has also created a site suitability classification specifically for purpose-grown woody biomass. It uses agriculture land bases to identify the bio-geoclimatic variables to produce a satisfactory woody biomass yield to economically produce certain wood-based end products. In other words, crop volume and attributes can be customized from specific sites to provide the feedstock needs for an end product. “Basically what we have witnessed through our research and development is that 8 to 12 times the yields can be garnered from a purpose-grown plantation versus a natural forest,” says Sidders. These plantations can also be located within close proximity to the final user and methodologies have been developed by CWFC to finely manage these plantations to maximize health and yield. “Tree solids are half carbon, and are thus significant contributors to our carbon budgets, and if we look at the issue of a changing climate, they can contribute both from a carbon perspective as well as an offset perspective by developing new and alternative energy sources,” says Sidders. Canadians now have a good understanding of the location, attributes, science and management of these woody biomass resources because of the work done to date by CWFC. The challenge now is to identify what opportunities and challenges exist to fully benefit from these readily available resources to both grow the bioeconomy and address climate change issues. For more information about woody biomass options and opportunities in Canada, contact Derek Sidders at derek.sidders@canada.ca or Tim Keddy at tim.keddy@canada.ca. Wetlands, a critical and valued component of boreal landscapes across Canada, comprise a significant proportion of operational tenures within the in situ oil sands regions of Alberta. The Canada’s Oil Sands Innovation Alliance (COSIA) Land Environmental Priority Area recently initiated a project to create an inventory of shared practices, improve knowledge sharing, clarify knowledge gaps, and identify opportunities for innovation. To accomplish these goals, standard operating procedures from COSIA companies were reviewed and interviews with key company personnel were completed. A series of field visits were conducted to further understand the context for practices and to observe their effectiveness. FPInnovations brought to the research team its expertise from the forest industry, which could also be applied to in situ oil sands operations. Terry Osko, from Circle T Consulting, and Matthew Pyper, from Fuse Consulting, also shared considerable expertise from their personal fields of focus. The result was a wetlands shared-practices toolbox which summarized several common and uncommon practices in field-ready factsheets. Common practices included pre-planning efforts to understand wetland characteristics, use of culverts, and use of geosynthetics to improve bearing capacity. Uncommon practices included the use of corduroy in road and pad construction, use of rock drains to improve drainage, and use of piles to support culverts during road or pad settlement. 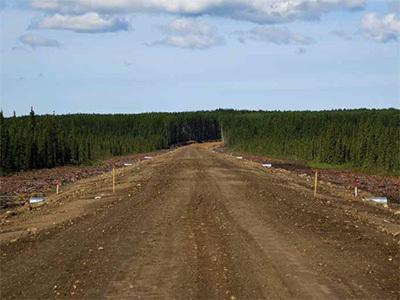 Providing time for peat consolidation during a road or pad construction sequence was a practice that was increasing in popularity due to the improved effectiveness and reliability of the compressed matrix. The full report is available by consulting COSIA’s website: https://www.cosia.ca/sites/default/files/attachments/COSIA-WetlandSharedPracticesReport-2018-02-27.pdf.